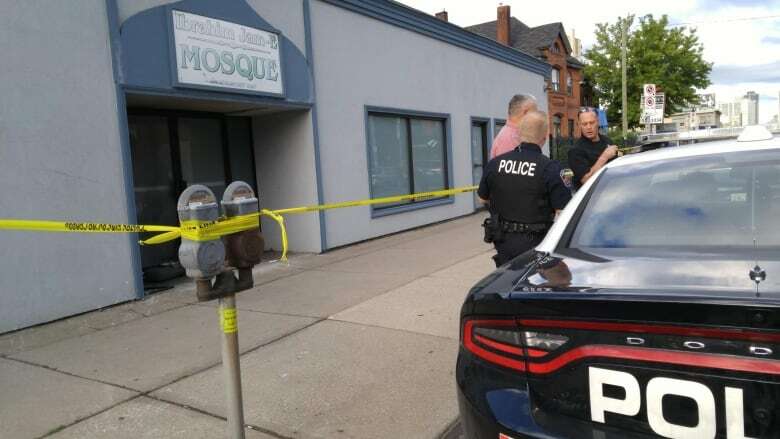 The number of police-reported hate crimes against Muslims jumped by 60 per cent in 2015 compared to the previous year, according to Statistics Canada. New data released Tuesday show there were 159 anti-Muslim incidents reported to police that year, up from 99 the year before. National Council of Canadian Muslims vice-chairman Khalid Elgazzar called 2015 a "difficult year" for Muslim Canadians, as two terrorist attacks in France inflamed anti-Muslim sentiment and former prime minister Stephen Harper made a woman's right to wear a veil at citizenship ceremonies a "central issue" of the election campaign. "The Canadian Muslim community bore the brunt of sinister political rhetoric surrounding the federal election which painted Muslims as terrorists or terrorist sympathizers as well as being anti-women," he said during a news conference on Parliament Hill. He stopped short of blaming the Conservative campaign for the rise in hate crimes, but said the campaign rhetoric was "a factor." Elgazzar said many victims of hate crimes do not report to police because they are fearful of further victimization or don't think police will do anything. He called on governments at all levels to boost funding for police investigations and data collection to better understand the scope of the problem. Farhat Rehman, of the Canadian Council of Muslim Women, said there must also be more money spent on education to curb the "disturbing" trend. "All levels of government need to step up with more resources and act quickly to allocate urgently needed funds to school programs and agencies involved in education, public awareness and prevention of conflict and violence in our communities," she said. Hate crimes target Indigenous people in Thunder Bay, Ont. 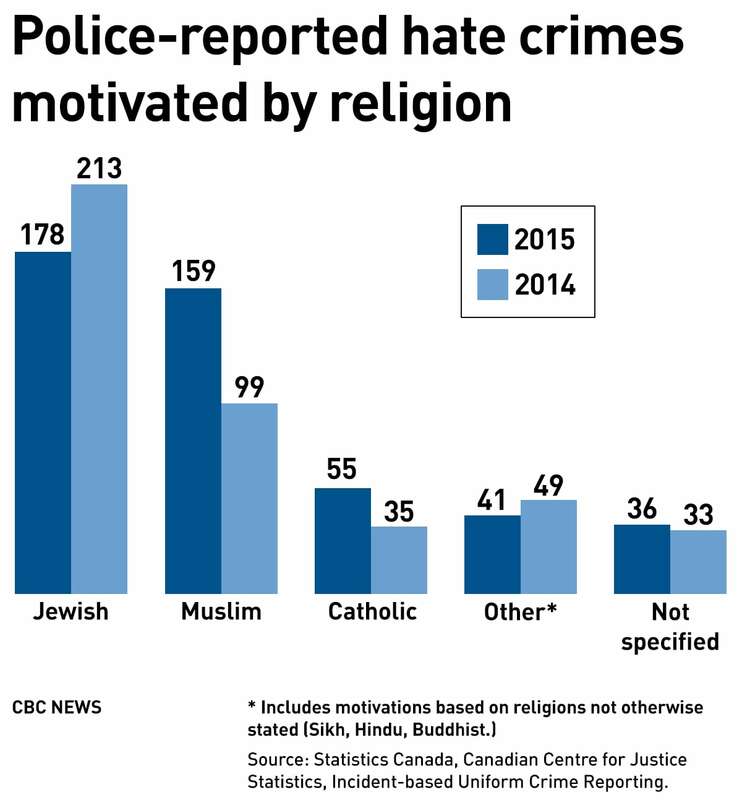 The Statistics Canada data show the number of incidents targeting Jewish people declined to 178 in 2015, compared to 213 the previous year. Jewish Canadians remained the most targeted religious minority, a trend that Shimon Koffler Fogel, CEO of the Centre for Israel and Jewish Affairs, called "disturbing and clear." "This should be of grave concern to all Canadians because anti-Semitism has historically been a telling indicator of the overall health of a society's values," he said in a statement. "Those who target Jews ultimately threaten the freedom, equality, and security of all." Mark Zarecki, of Jewish Family Services, said even non-violent incidents such as the spraying of anti-Semitic graffiti can be traumatizing. "It's almost like post-traumatic stress disorder," he said. Hate crimes motivated by sexual orientation fell to 141 reports to police in 2015 from 155 the year before. But the incidents tended to be more violent in nature, with 42 per cent reporting an injury. While reported hate crimes targeting blacks also declined, they still made up the largest percentage of the total number. There were 224 incidents in 2015, making up 17 per cent of all hate crimes, compared to 238 the year before. Black activist and Muslim Chelby Daigle said while many people are linking the more recent apparent rise in hate crimes to the policies and rhetoric of U.S. President Donald Trump, she said the young age of perpetrators and victims suggests a "homegrown" problem. She called for more research to get a handle on the underlying causes and motivations for hate crimes. "If we're not knowing what is going on, this is going to just continue," she said. Public Safety Minister Ralph Goodale said the government is making targeted investments to combat racism and protect infrastructure of ethnic or religious communities at risk, but said he would consider a request to fund data collection and research. Calling the increase in incidents "deeply troublesome," Goodale said it flags the need for collective vigilance. "We all need to work very hard to reinforce the generous, inclusive, accommodating nature of the country that has made us the finest example of pluralism the world has ever known," he said. Statistics Canada found that overall, hate crimes climbed by five per cent in the reporting period. There were a total of 1,362 incidents motivated by hate based on race, ethnicity or religion, 67 more than in 2014. Violent offences, including assault, threats and criminal harassment, accounted for 38 per cent of police-reported hate crimes in 2015, a rise of 15 per cent from 2014. During the same period, the total number of non-violent incidents such as mischief, vandalism and graffiti increased by five per cent. While Statistics Canada found eight of 10 provinces reported an increase in police-reported hate crimes from 2014 to 2015, the most pronounced jump was in Alberta, where police reported 193 hate crimes, up 39 per cent from the 139 reported the year before.